I have always been a fan of the Petersburg Campaign, as regular readers of this blog well know. I have been especially intrigued by the ability of the Confederates to inflict casualties far out of proportion to the numbers of troops involved, especially at the Battle of Jerusalem Plank Road and Second Reams Station. Some have pointed to Confederate division commander William Mahone and his intimate knowledge of the landscape around the Cockade City. Others point to the way in which the North raised brand new regiments of recruits rather than reinforcing existing units. Still others point to the superiority of Southern soldiers (a theory I don’t particularly believe in). The one idea which may hold more merit than all others concerns the ANV’s sharpshooter battalions. This is where Fred Ray’s new book comes in. 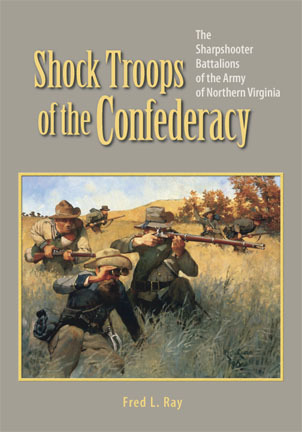 It focuses on the development of Sharpshooter Battalions in the Army of Northern Virginia, as the title readily suggests. 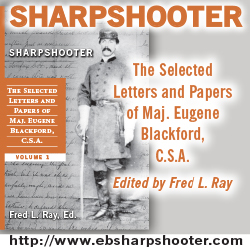 Brigade and later Division commander Robert Rodes was instrumental in providing the support necessary to take hand picked members of a brigade (and later divisions) and form them into these sharpshooter battalions. These units were perfect for manning the skirmish line in a protracted siege such as the one at Petersburg, and their ability to penetrate the enemy’s front line quickly and stealthily also was probably a major reason for some of the lopsided numbers involving Union captured at several of the battles between North and South during the siege. The book is available for purchase from the author’s web site. I will be writing an extended set of blog entries over the next two weeks detailing Mr. Ray’s findings, and I hope to write a review at the end. The author’s study is ground breaking due to the fact that only one (!) 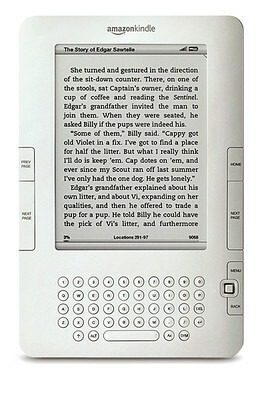 book has been written on the subject in the last hundred plus years, before the turn of the century. I find it amazing that no one else found this subject fascinating to tackle in a book-length study. I believe this to be one of the most important books to come out on the Civil War over the last few years. It definitely deserves some recognition, and I hope my own meager contribution to that end encourages some of you to purchase it.